Calculates a nearest neighbor index based on the average distance from each feature to its nearest neighboring feature. The Average Nearest Neighbor tool returns five values: Observed Mean Distance, Expected Mean Distance, Nearest Neighbor Index, z-score, and p-value. The values are written as messages at the bottom of the Geoprocessing pane during tool execution and passed as derived output values for potential use in models or scripts. You may access the messages by hovering over the progress bar, clicking on the pop-out button, or expanding the messages section in the Geoprocessing pane. You may also access the messages for a previously run tool via the Geoprocessing History. Optionally, this tool will create an HTML report file with a graphical summary of results. The path to the report will be included with the messages summarizing the tool execution parameters. Clicking on that path will pop open the report file. The z-score and p-value results are measures of statistical significance which tell you whether or not to reject the null hypothesis. Note, however, that the statistical significance for this method is strongly impacted by study area size (see below). For the Average Nearest Neighbor statistic, the null hypothesis states that features are randomly distributed. The Nearest Neighbor Index is expressed as the ratio of the Observed Mean Distance to the Expected Mean Distance. The expected distance is the average distance between neighbors in a hypothetical random distribution. If the index is less than 1, the pattern exhibits clustering; if the index is greater than 1, the trend is toward dispersion or competition. The average nearest neighbor method is very sensitive to the Area value (small changes in the Area parameter value can result in considerable changes in the z-score and p-value results). Consequently, the Average Nearest Neighbor tool is most effective for comparing different features in a fixed study area. The picture below is a classic example of how identical feature distributions can be dispersed or clustered depending on the study area specified. If an Area parameter value is not specified, then the area of the minimum enclosing rectangle around the input features is used. Unlike the extent, a minimum enclosing rectangle will not necessarily align with the x- and y-axes. When chordal distances are used in the analysis, the Area parameter, if specified, should be given in meters. There are special cases of input features that would result in invalid (zero-area) minimum enclosing rectangles. In these cases, a small value derived from the input feature XY tolerance will be used to create the minimum enclosing rectangle. For example, if all features are coincident (that is, all have the exact same X and Y coordinates), the area for a very small square polygon around the single location will be used in calculations. Another example would be if all features align perfectly (for example, 3 points in a straight line); in this case the area of a rectangle polygon with a very small width around the features will be used in computations. 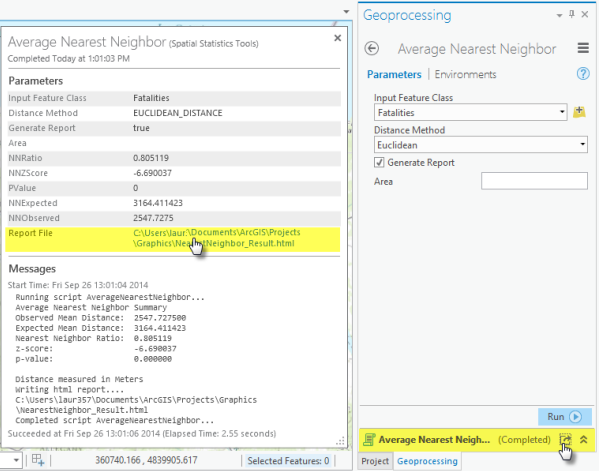 It is always best to supply an Area value when using the Average Nearest Neighbor tool. Although this tool will work with polygon or line data, it is most appropriate for event, incident, or other fixed-point feature data. For line and polygon features, the true geometric centroid for each feature is used in computations. For multipoint, polyline, or polygons with multiple parts, the centroid is computed using the weighted mean center of all feature parts. The weighting for point features is 1, for line features is length, and for polygon features is area. The feature class, typically a point feature class, for which the average nearest neighbor distance will be calculated. A numeric value representing the study area size. The default value is the area of the minimum enclosing rectangle that would encompass all features (or all selected features). Units should match those for the Output Coordinate System. The nearest neighbor index value. The following Python window script demonstrates how to use the AverageNearestNeighbor tool. The following stand-alone Python script demonstrates how to use the AverageNearestNeighbor tool.